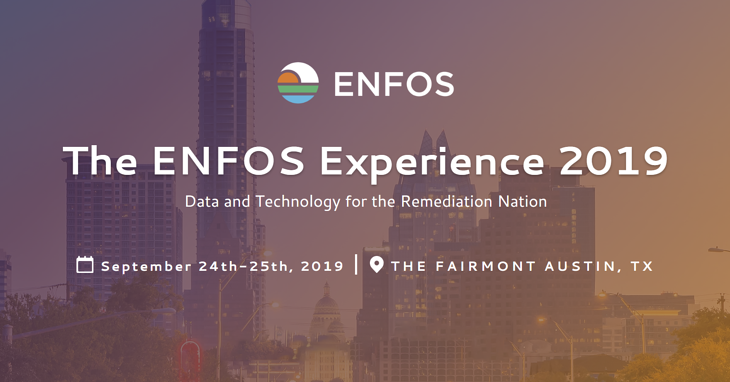 We're proud to announce The ENFOS Experience 2019! On September 24th - 25th, we're bringing together remediation executives and professionals from all over the nation to the Fairmont Austin in Texas for two full days of presenting and discussing critical strategic issues and cutting-edge practices selected to help push the limits of your project and portfolio management performance. This year features a dream team of speakers from the remediation industry from companies such as Dow, PG&E, Total S.A., Cumberland Farms, The U.S. Defense Logistics Agency, Valero, Nutrien, Pace Analytical, AECOM, Arcadis, Golder and more. The definitive collaborative remediation conference - focusing on topics such as enterprise business intelligence, innovative and emerging information technologies, software implementation success stories, and operational excellence strategies all centered around the environmental remediation function. Over 20 presenters from industry, consulting, and technology showcasing their data stories and strategies in a concise, visual format. Breakout sessions focused on how ENFOS solutions are used to solve key business problems. Training sessions for the new ENFOS Data Insights Module and more. A special ENFOS Artificial Intelligence presentation featuring the results of ENFOS AI projects. A keynote speaker in Jim Davidson - a NYT best selling author, resilience expert and a longtime environmental professional. Two networking events (Monday's evening reception and Tuesday's networking dinner) for the 150 attendees and guests. Venue is the brand-new, world-class Fairmont Austin, located in the heart of Downtown Austin. ENFOS is also proud to announce the sponsors of The ENFOS Experience 2019: Pace Analytical, AECOM, Arcadis and Golder. For registration and more details, visit our conference page. ENFOS is a SaaS platform that expertly manages all the complexities of remediation and asset decommissioning including reporting and disclosure requirements associated with ASC 410 and IFRS standards. ENFOS technology supports seemingly disparate data types and processes such as technical data and financial data to unlock the unknowns like root cause, cost drivers, and best practices. The company’s solution integrates easily with customers’ ERP systems and legacy applications, providing for seamless real-time knowledge. Customers include BP, Total, Kinder Morgan, ConocoPhillips, Celanese, 7-Eleven, Canadian National Railway, Ashland and The RACER Trust. ENFOS, Inc. is headquartered in San Mateo, California, with offices in the Chicago area, and China. For more information, contact us or call us at 1 (888) 838-7767.